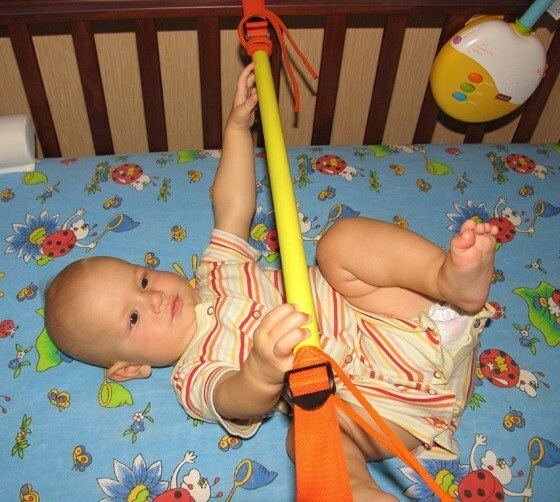 The horizontal bar in the baby cot is a simple and inexpensive device. It can be purchased in the store, and the tinkerers can make it on their own. Nothing complicated about it, and the baby will get a helpful trainer. Using the installed in the bed of the horizontal bar you provide the baby the opportunity to develop agility and strength from the very first weeks. Young children have a highly developed grasp reflex, which facilitates habituation to the projectile. Very useful to start to encourage the child to catch up, grasping the fingers of an adult. Put the baby on his back and put him in the palm of their thumbs. He felt that to palm something touches, it is sure to grab your fingers and try to zoom in. The result will be something like pull-UPS on hand, with tearing in the shoulders and back from the surface. Such exercises are very useful for muscle development. Setting the bar in the bed, you will be able to teach the child to develop muscles. Training on this simulator to help strengthen the neck and back, making the baby more confident turns from side to side, holds the head and generally in physical relationship develops perfectly. To teach the child to cope with the horizontal bar, to do better. Strengthen the shell at this level from the chest lying in the toddler bed, so he hands could get to stick. Brush the baby put on the bar palm down. Grasping reflexes will make it hard to clasp is attached to the hand object. After several similar exercises, the baby will begin to grab the bar and pull. Even just hold the bar will be useful. For the horizontal bar will need only a round wooden stick of the desired size. But you can make sports equipment more attractive to the child – for example, decorate it with bright colored elements add fun detail. In stores for sewing, you can find many interesting things. Try to make a bar with such materials: round wooden stick, varnished, so there are no splinters; color Laundry gum – contrast picture on a stick and create additional terrain for the tactile sense; the laces with tips for attachment to the bed; a pair of bells. At the ends of the sticks drill the hole – they will have to stretch the laces. Stick tightly wrap a rubber band at the ends to hang the bells. Tie a stick in the laces across the bed to the rods at such a distance that the child took her hands. Gradually, as the child grows, the stick will need to raise. Also during class is necessary to watch that horizontal bar kid kept correctly, his thumb should be opposite the others.